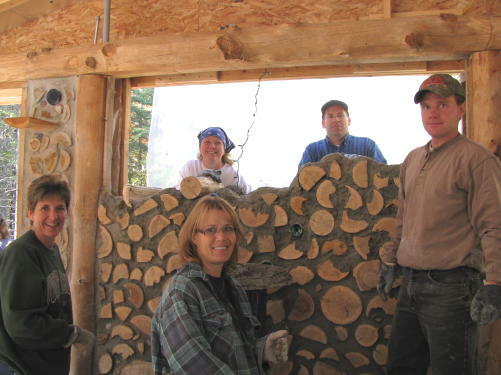 We built a cordwood warming hut at the Merrill School Forest that morphed into a public school classroom along the way. The goal was to create a natural building using materials from the surrounding woods for students to warm up in on their winter hikes. 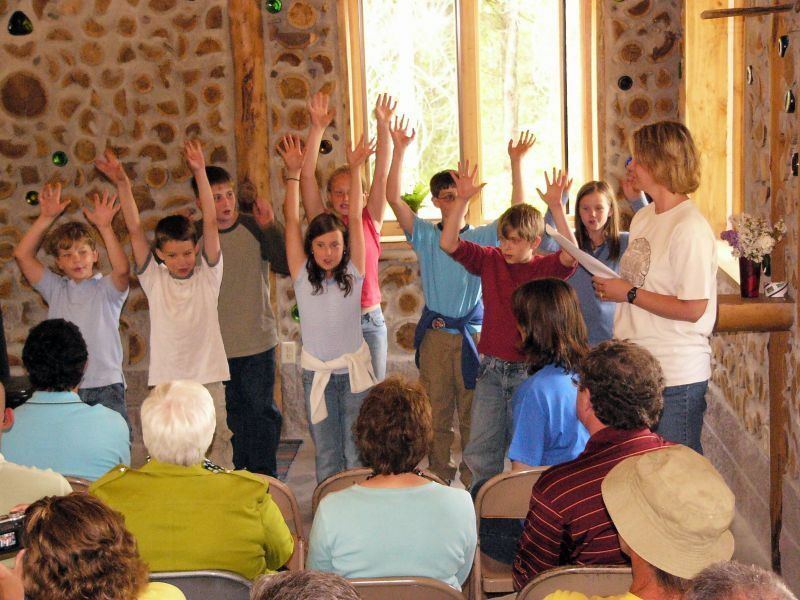 The result is a state code-approved, public school classroom that boldly demonstrates “best practice building” using sustainable methods. 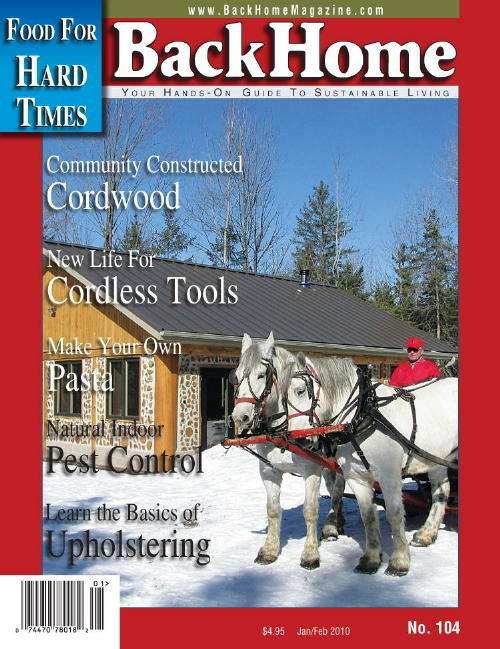 Many of these techniques can be used with other alternative building methods like strawbale, cob, earthen plaster, adobe and cobwood. 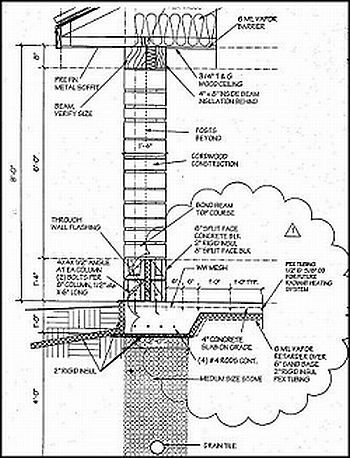 The building started with architectural drawings and blueprints. These were sent to the state capitol in Madison, Wisconsin to be assessed for code compliance We were pleased when they were approved. 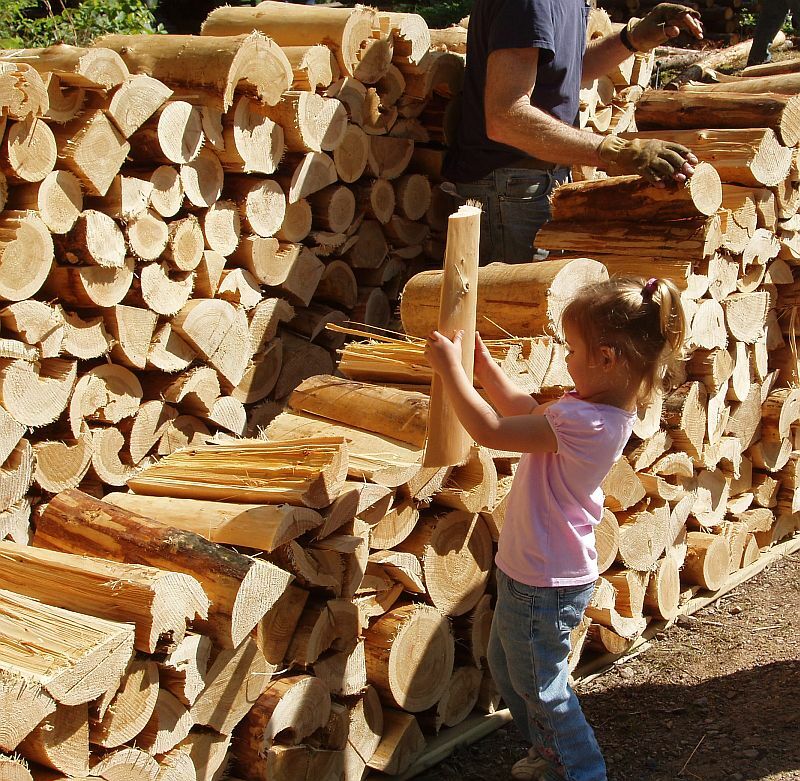 The wood for the entire building (posts, cordwood, window boxes, panelling, trim) was cut within 1000 feet of the building site. We used tamarack (larch), pine, spruce and balsam. Crews of community volunteers from ages 4 to 80 turned out to help. 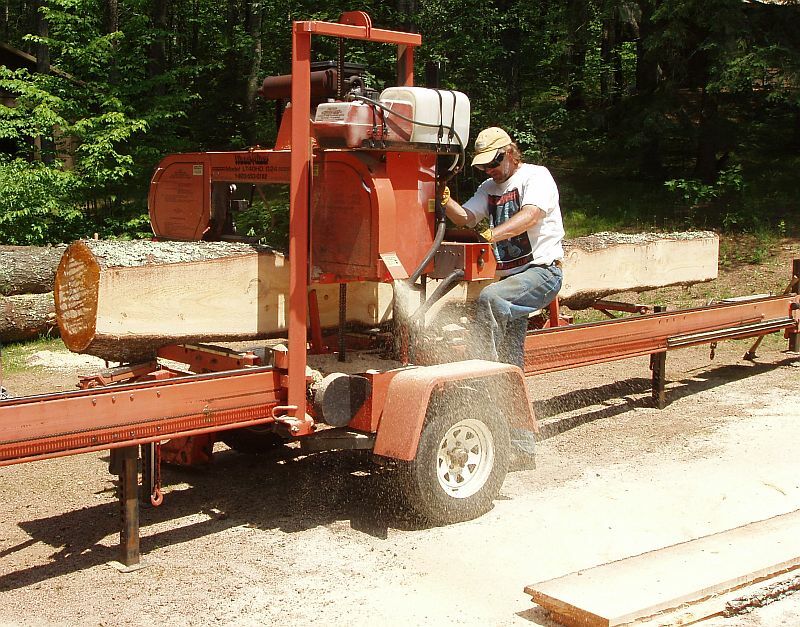 A Wood Mizer cut all the posts, beams and one inch lumber. For planning, we started with an architectural drawing. A 4″ perforated drain tile surrounds the foundation and carries the water away. 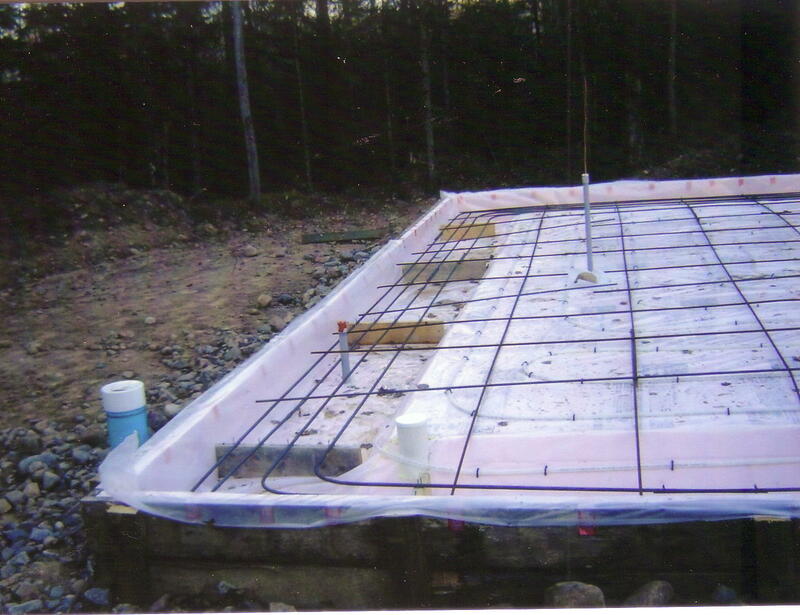 We topped it with a Frost Protected Shallow Foundation (FPSF). Five million of these foundations have been built in Norway, Denmark, Sweden and Finland and they are now approved in the USA and Canada. They work very well in cold climates, keeping the heat in the building and most are outfitted with radiant-in-floor heating systems. 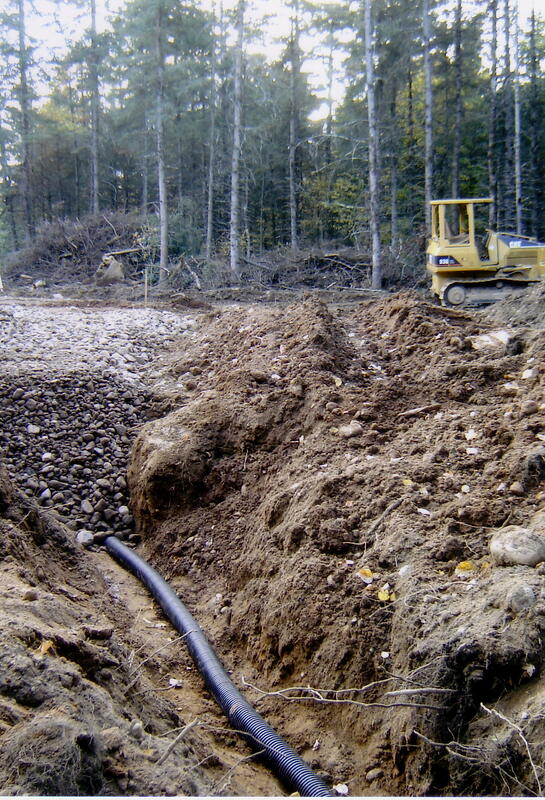 This type of foundation saves money by reducting materials and excavation costs. 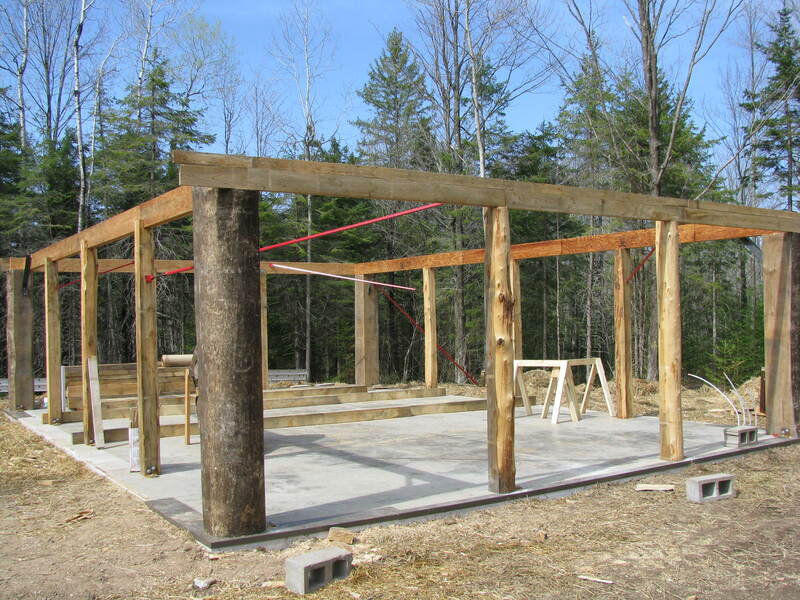 The building was framed using heavy timbers of pine and tamarack (larch). 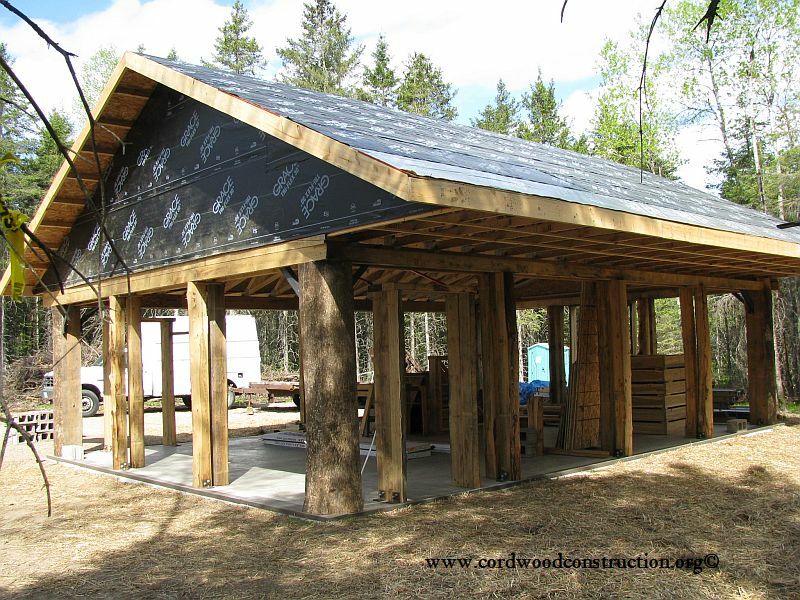 The roof truss was built with a 14″ Energy Heel so that starched cellulose could be packed to the outside edge of the top plate, giving the roof an R-value of 53. The high school construction classes and middle school students came to work and learn. They wanted to live and work here all semester. 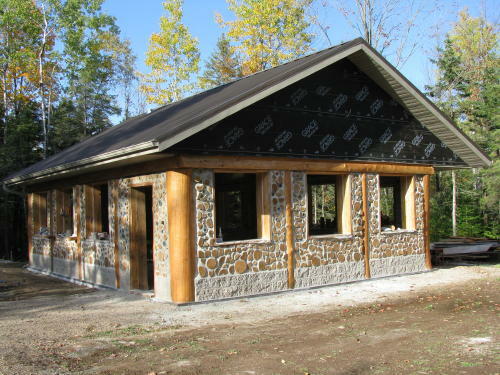 The split faced blocks are needed in this area because of the high snow depth (70″ per year) to protect the cordwood. The double posts allow for a 16″ wall, which not only provides an excellent thermal mass, but also an R-value of 24. 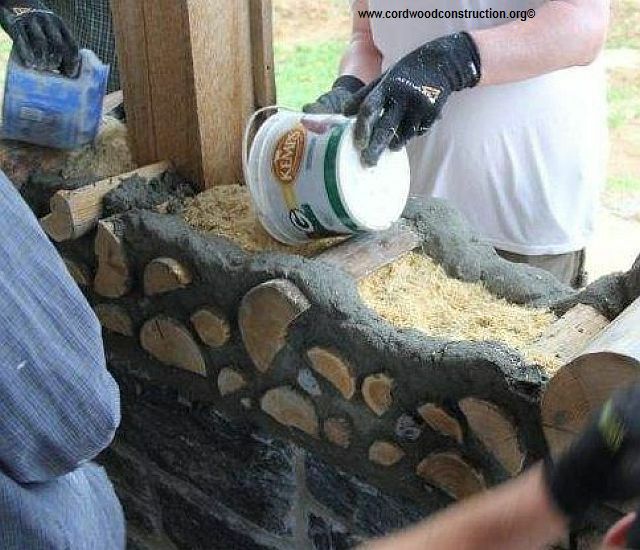 The sawdust mixed with lime provides a thermal break. 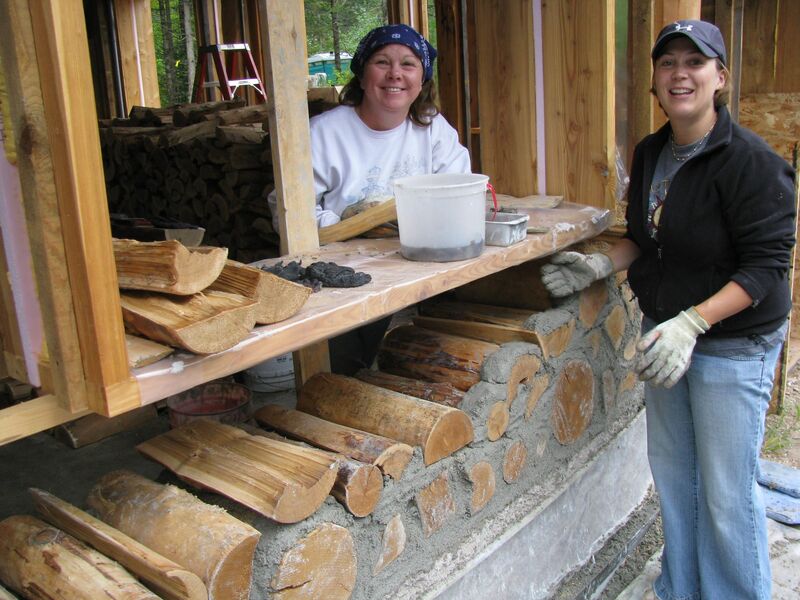 As the walls began to rise, the community came together to help. Building the Big Dipper wall with seventeen volunteers. Below, ready for the windows and doors as Autumn approaches. The cup end of the dipper points to the North Star. “Follow the drinking gourd” was what Harriet Tubman sang to her escaping comrades. The dedication was planned and celebrations took place. 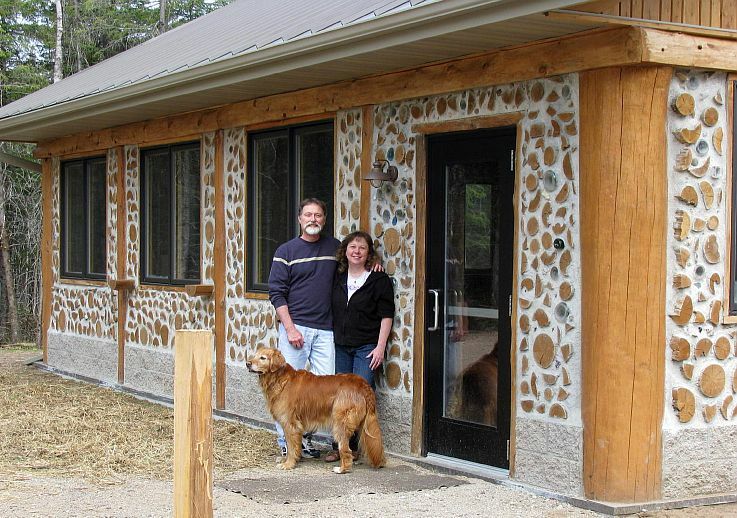 The Cordwood Education Center is now used every day by the students of the Merrill Area Public Schools. It is also used as a Warming Shelter by weekend skiers and hikers. Click on the BACKHOME COVER to read the article. The local and national media paid close attention to the project. 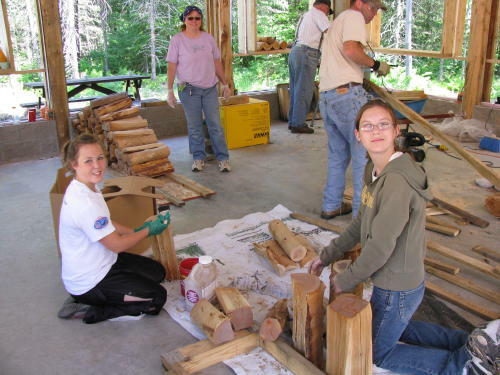 Many other cabins, homes and cottages have been built using the Cordwood Education template. 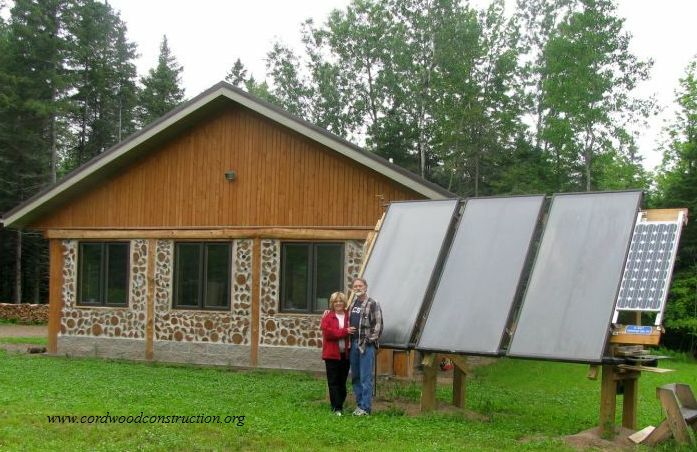 We host an annual Solar Tour of Homes and Businesses. Best Practices used in this building. 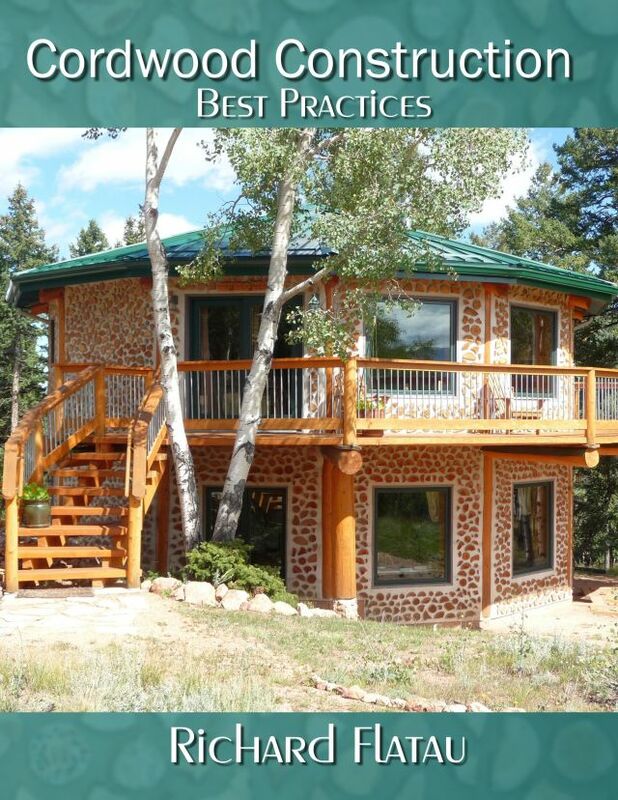 Not everyone has to use all these best practices. They are simply listed herein for the owner/builders consideration. The choices you make will be based upon your time, talents and treasure.